Rapid Evaluation and Symptom Support Cancer Unit (RESSCU) is where symptoms and side effects like pain, nausea and vomiting can be managed. The service is led by nurse practitioners and gives people receiving cancer treatment direct access to a highly-trained team to help them manage their symptoms and the side effects of treatment. This type of tailored care allows more people to get the treatment they need in the unit, rather than being admitted to the hospital or visiting the emergency department. 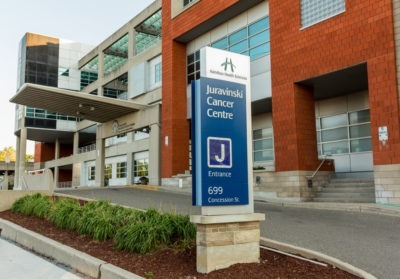 The program is closely linked to Oncology Day Services where patients can receive extended care outside of RESSCU’s operating hours. An appointment is necessary to visit RESSCU. Please discuss with your oncologist whether RESSCU is appropriate for you.